Haneru is a middle school student who loves dance to the point he can hear rhythm in the sound of chalk during class. One day after school, in the secret spot where he practices dancing, he meets Kanon, who's there to practice as well. The have a great time dancing together, and eventually face off against rivals in dance battles as they grow up. Episode 1: The Moves of Fate! The Two Meet! Haneru discovers that he's not the only one who loves Jay El and dancing to hip hop with every spare second! Episode 2: Tribal Soul! On Stage! Kanon never expected anyone would find out her secrets, now she doubts if she'll ever dance again. Episode 3: Challenge! Dance Battle! The members of Tribal Soul come looking for the fresh faces they saw at the dance competition and Haneru and Kanon start to take things more seriously. Episode 5: Moves to the Max! Our Appeal! Episode 6: The Dance Battle Strikes Back! When Kanon and Haneru finally get a rematch, will they show improvement? Is there any of Haneru's trademark jumps?! Episode 7: Tri-Crew Activate! Haneru VS Spider! Episode 8: Prepare for Dance Road! Who’s the center? Episode 9: Bewitching Steps! Kanon's School Festival! Episode 10: The Mysterious Tengu legend. Yuzuru has vanished! Haneru decides to pursue the person who's been watching the crew. When she catches a girl named Momiji, she has a lot of questions that need to be answered! Episode 11: Let's Go To Dance Road! On the first day of practice Haneru and Kanon are excited to get started. Haneru is so excited that he doesn't feel the need to warm up, Kumo has a problem with this and yet again, they are at each other's throats. Episode 12: THE BOOMBOX MACHINEGUNS AT THE SPEED OF LIGHT!! Episode 13: Touch Them! Christmas Dance! It's Christmas Eve and the gang decides to go out for a special meal after practice, Kumo refuses and skips practice too. 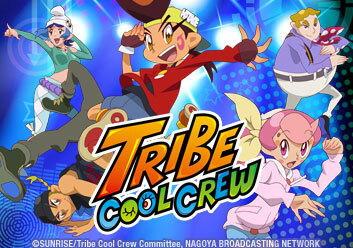 Tribe Cool Crew is on a new mission, to find out what better things Kumo has to do today. Episode 14: Crash Course! Handspring! Haneru has his special move, but what does Kanon have? When she's challenged to do a handspring in class she becomes inspired for her new move and surprises the crew! Episode 16: Jey El in Japan! Episode 17: Fight, Tri-Crew! Shocking Dance Road! The term "Doing the robot" has a whole new meaning when Tribe Cool Crew meets their competitors at the second round of Dance Road! The team will have to learn to fight for their place in the midst of brutal competition. Episode 18: They're Having a Fight?! It Started With a Squid! Haneru and Kanon quarrel over who has the better snacks. The rest of the team hear of the argument which creates a snowball effect causing everyone to not get along. Haneru shocks everyone with his newly evolved dance. He calls it the Galaxy Walk. Problem is, he cannot repeat it. Mr. Wakui stops by to help them get the move right. A stranger who Kanon does not know is persistently trying to recruit her to his talent agency. Episode 23: Lui and Moe! Episode 24: Foggy Dance Road Tower! Kanon wears a new out fit that surprises the crew. On their way to Jey, the Tribe Cool Crew are disoriented by the thick fog. Episode 25: The Dancing Master T! The Tribe Cool Crew are facing their final contest and precision is the theme to this competition and they have only got one shot at winning. Episode 26: Moves in Full Bloom! Dancing Before Flowers! Mizuki has agreed to train some young at heart dancers. Because of her efforts, she has become over worked and the lack of energy begins to show. Episode 29: Spin And Transform! Yuzuru's True Form? While Kimika and Yuzuru are at a tea shoppe looking for Ms. Otsuru's legendary Miracle Diamond tea, robbers arrive causing panic to set in. Episode 30: Lui and Moe Once Again! Lui and Moe have changed up their dance style and are ready to prove they are the best dancers. Episode 31: Ayumu's Operation Romance! Ayumu tries to play matchmaker when she suspects Kanon is falling in like with Haneru. Episode 33: What Happened to Kanon? Ever since Kanon had a strange dream, she has been nervous and aloof. The dream has started to take a toll on her and is starting to show in her practices and her perfomances. Kumo feels that Kanon and Haneru's skills are being held back because they have grown too comfortable and he chooses to split the group up because of this. Episode 35: The Fateful Decision! Twins or Croquettes?! Hinata, and Yuji practice with Manabi and realize that they would just not mesh together as a crew. Episode 37: The Terrifying Spider Mansion! Episode 38: The Required Change! Overcome the Dance Road Challenge! Episode 39: Haneru VS Crowd High! The dance crews have been able to make tv appearances and become household names at Haneru's school. Haneru thinks how this can be and looks to get Tribe Cool Crew more known. Haneru takes up the advice that Lui and Moe give. He pours emotion into his routine and instantly feels more connected and powerful in his moves. Tri-cool heads to the beach to celebrate Kumo recovering from a foot injury. Episode 42: Happy! Operation: Shopping Spree?! Kanon gets sidetracked on her gift buying adventure at the mall and winds up in a dance contest. Episode 43: Did You All Get It Done? The Research Project! Summer’s here but Haneru is in a bind. He has no idea what to do for research. All is lost, however because Koji has the bright idea of working together to get it finished. Episode 45: We Have Finally Come to Jey’s Island! Episode 47: Blossom Bullets Rises to the Challenge! Episode 50: The World Can Change! Dance Can Change It!